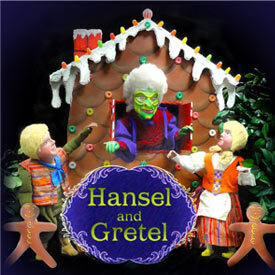 This year, the senior designer and technical director of Kathy Burks Theatre of Puppetry Arts along with other team members spent 120 hours designing and sculpting new heads for the title characters of HANSEL AND GRETEL. As the senior designer, Sally Fiorello oversees all designs, construction and physical aspects of this show. She is also an actor and Master Puppeteer with the Kathy Burks troupe and she previously co-directed many of their shows. Once the design process is under way, every puppet, set piece, prop, costume and lighting design needs her approval. In order to comprehend the design process for the new character heads, we caught up with Sally, who explained it all. When we first created the heads several years ago, the design process was under various time constraints that come with producing a new show, so it was impossible to make two new stars at the last minute. After all, it’s not just a matter of firing a couple of human actors and hiring two replacements. As difficult as that is, it’s not as hard as creating them from scratch. 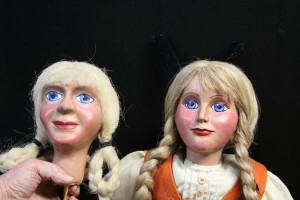 Troupe member Beck Schlabach was the main creator of these heads during the design process; other than a few finishing touches, she created them by hand. 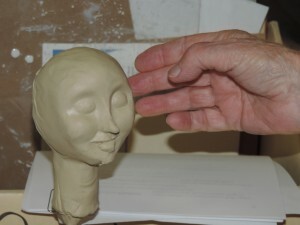 Using a plasticine clay, we first sculpt the overall shape of the head. Once we’re satisfied with the look, we create a “negative mold” using a silicone, rubber-like material. After the mold has dried, we pour (or cast) the heads using a Polyurethane casting resin. Once the casting has cured, we remove it and sand and repair any imperfections. Then we prime, paint and add hair or fur as the character demands. Many more steps happen even after the hair has been added before we finally complete the finished (full-bodied) puppet. 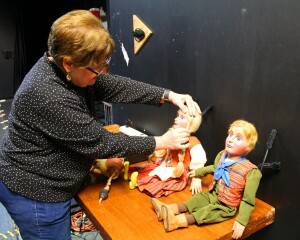 It might have taken 60 hours per puppet, but Sally said the whole troupe is satisfied with the look of each new head. You got a closeup of each work of art in this blog, but don’t miss out on seeing this art in action! 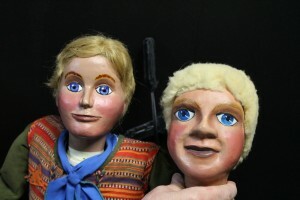 Come see the new heads onstage while HANSEL AND GRETEL runs from Now through April 3, 2016. For tickets call the Box Office at 214-740-0051 or visit dct.org.